IN A WORLD MARKET spurred on by nations all looking for the best buys, Asia holds first place in multi-product imports into Savannah. Of the total volume of imports into Savannah port aboard containerships during the current fiscal year, more than three quarters of it arrived from Asia. Of the 947,933 TEUs that arrived here aboard container ships during fiscal year 2007, some 737,571 arrived from Northeast Asia, Southeast Asia, and Southern Asia/India, according to statistics provided by PIERS, a service of the Journal of Commerce. TEU is short for “twenty-foot equivalency units.” The term TEU is used instead of “container” because containers come in two lengths, 20 feet and 40 feet, explained Judy Wolfe, GPA administrative assistant in external affairs. “One twenty foot container equals one TEU, so a 40-foot container would equal two TEUs,” she says. But it’s also interesting to note that more than 51 percent of the total volume of exports from the Port of Savannah during that same time period were bound for Asia, said Robert Morris, director of external affairs for the Georgia Ports Authority. A lot of tractors and earthmovers are produced in Georgia and shipped to Asia. The Atlanta area produces a lot of electronics and many chemicals products are produced mid-state, much of which can end up in containers bound for Asia through Savannah’s ports, Morris says. It isn’t about where the product is made any more as world trade moves forward, it’s all about how inexpensively the product can be purchased, Morris explains. 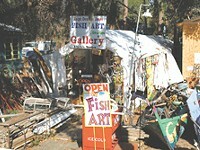 So end-use items like clothing, computers and other electronic items produced and shipped from Georgia to Asia might easily mid-ocean pass containerships carrying clothing, computers and electronic items produced in Asia and headed for stores in the United States. The number one import coming here from Asia is furniture, followed by retail consumer goods headed to Wal-Mart and Target and similar stores, hardware and house wares, machinery and toys, apparel, automotive parts, and minerals. But scrap metal isn’t Georgia’s number one export to the Peoples Republic of China; wood pulp is - followed by poultry and raw fabrics, including one of our most historic exports, cotton. And our number one export to India is paper and paperboard, followed by wood pulp, then fabrics, including cotton. Top exports to the countries of Taiwan, Japan and the Republic of Korea are clay, followed by wood pulp; Hong Kong is first for foam waste and scrap, followed by mixed metal scrap and wood pulp; Singapore’s number one import is resins and rubber; for Indonesia it is our fabrics, including cotton, and the same is true for Thailand, which also imports wood pulp; number one export to the Philippines and Malaysia is paper and paperboards, followed by wood pulp and fabrics, including cotton, while Vietnam, Bangladesh, and Pakistan import fabrics as their number one, including raw cotton; Sri Lanka’s top import is wood pulp, followed by fabrics, including raw cotton; and number one exports to the countries of Cambodia, Mongolia, Burma, Brunei, and Macau, in order, are: apparels, poultry; furniture; electrical cable and wire, cigars and cigarettes. After a journey of 15,000 nautical miles, four new cranes – the largest of their kind in the world - safely crossed the bar from the ocean into the Savannah River on February 12 and traveled the last few tricky navigation miles to their new home at the Port of Savannah’s containerdock. The Super Post-Panamax cranes, designed in Finland and built in China, were ordered two years ago from Konecranes VLC and their arrival at “the fastest growing port in the United States” is a significant step forward in the GPA’s long-term (2015) growth strategy, says Robert Morris, GPA director of external affairs. The new cranes have the capability of handling super post-Panamax vessels of a size 22 containers wide. Post-Panamax vessels are too wide for the Panama Canal, having widths up to 132-feet. 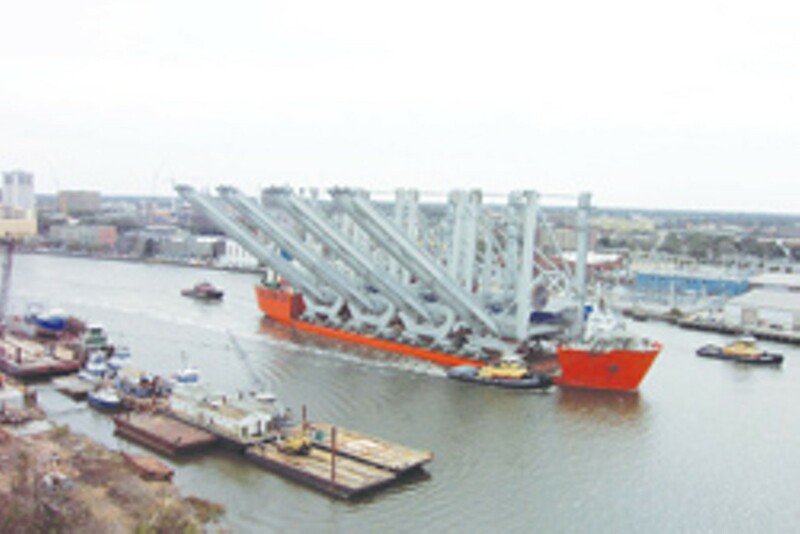 The cranes arrived aboard the vessel Dockwise Swift and with crane parts extended upward and outward, the vessel looked considerably different from other ships seen in the busy Savannah River. When fully assembled dockside the 480 feet long cranes will tower, with a 34-degree incline, some 367 feet above the water. The cranes weigh 1,369 tons. “It looked awesome going by this dock. People were coming out from everywhere to just look at it,” says Crescent Towing Company Dispatcher Frankie Davis, the company that supplied the third tractor tugboat needed for the job of getting the Dockwise Swift safely up the river. 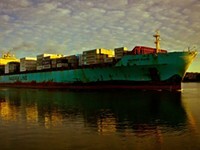 Moran Towing supplied the two other tractor tugs as well as the docking pilot, Robert Davis. Two river pilots, William T. Brown Jr., and G. Forrest Dyar Jr., were also aboard the ship to see her safely to the dock. Because of the height on its cargo, navigating the Dockwise Swift under the Talmadge Bridge required the vessel to travel within a specific tide window determined by the pilots. The electric-powered cranes will eliminate the use of about 500,000 gallons of diesel used by older cranes, and in the process, prevent the emission of 690 tons of nitrogen oxide, four tons of particulate matter, and 12 tons of hydrocarbons every year, Morris says.